So a couple of months ago when I moved into my new apartment I bought a huge TV for really cheap. Its a 60″ and it literally weighs 90 pounds. 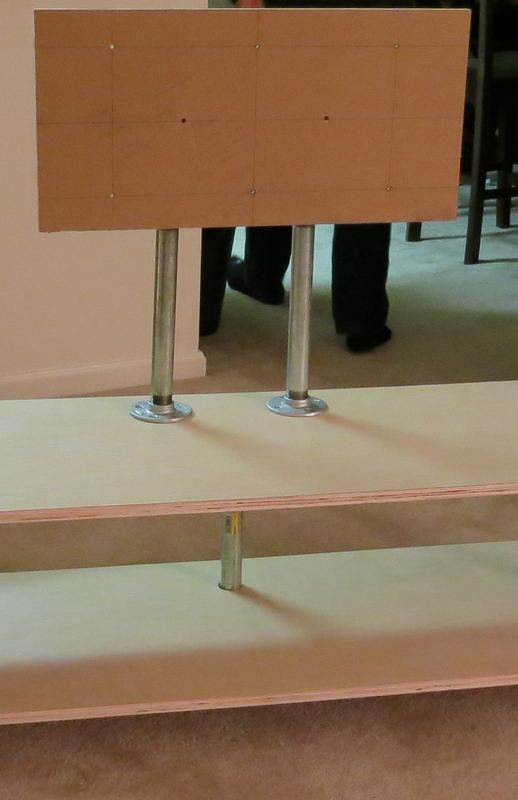 It didn’t come with a stand… Most TV stands that are designed to accommodate such a mass are pretty expensive, especially the ones that look good enough to be worth buying. 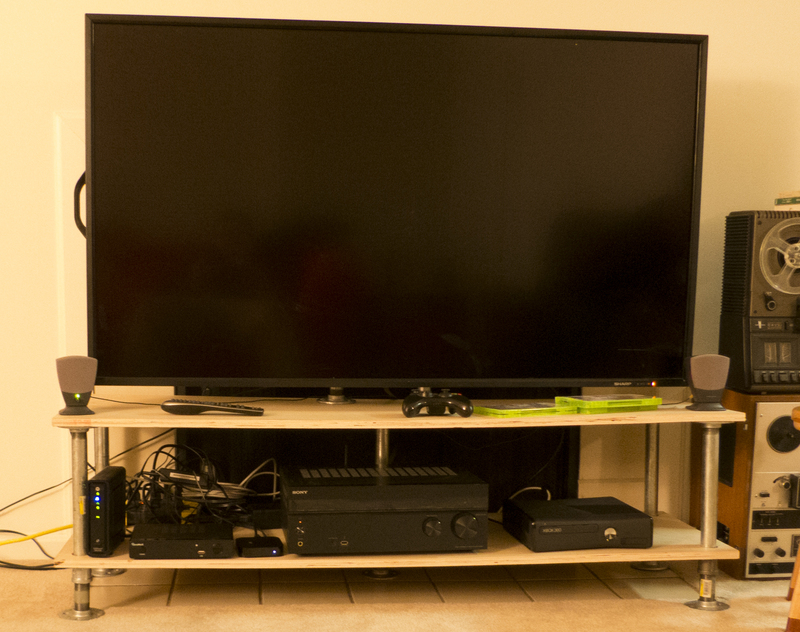 I opted to build my own based off of an idea I had to make my own mount for the TV as well. What I came up with was a credenza of plywood and galvanized piping that does a pretty good job of holding my TV in place. Mind the cables, they were kind of a mess when I took these. Hey, this looks like a plan I’ve been sketching up and had some questions on stability. Hi! So glad to hear that you’re also building one of these! Its holding up alright! 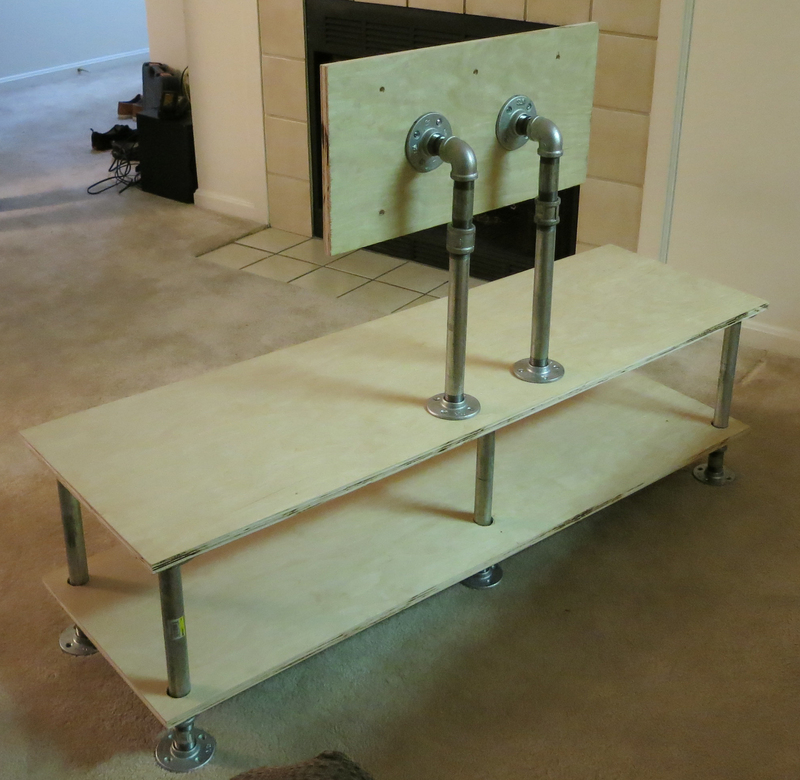 I would scale some things up a little bit if I were going to make one on wheels, definitely go with some thicker plywood, like 1″ thick probably. 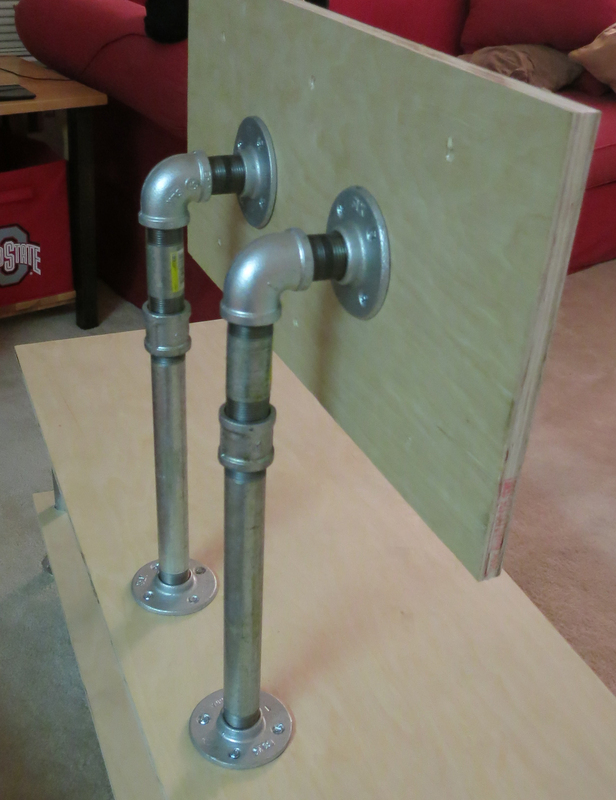 Mine was flexing a little in the center so I added another pipe post and foot there but if I were to rebuild I would go with thicker plywood or even 1″ hardwood of some type as the plywood I used flexes a little bit. Its really not top heavy at all but I am not moving it around so its hard to say how it would do with an application like that. I feel like maybe making it a little deeper wouldn’t be a bad idea in general, especially if it were going to be rolling around. What size TV are you making yours for? I’ve got a 42 inch. another thought is running the pipe uprights through the top shelf in and anchoring to the bottom, as well as adding some steel plates to the bottom for weight. Probably going to end up going with live edge or reclaimed 2 inch thick boards.